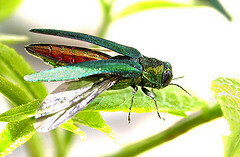 Adult Emerald Ash Borer. Image courtesy of U.S. Department of Agriculture. Today’s News to Us shares an article on how the winter impacted Emerald Ash Borer populations in the area. Also read two articles on the status of a couple of developments on Huron riverfront properties- Milford has a new brewery and Ypsilanti struggles to fill Water Street. Finally, Washtenaw County has a new reporting service for flood and drainage issues. After the Trees Disappear: Ash Forests After Emerald Ash Borers Destroy Them The cold weather did nothing to deter the Emerald Ash Borer’s march through the northern Midwest and east coast. The insect is decimating ash tree populations with implication far exceeding the loss of landscape and street trees. This article shares the status of the invasion and potential consequences for forests in our area. Water Street property falls short of initial expectations Debate about the fate of Ypsilanti’s Water Street property continues. There are high hopes for this riverfront property to provide river and open space recreation activities along with benefits for downtown businesses and residents. But interest in the property from investors has been sparse. Read about the latest discussions in this article. New River’s Edge Brewery now open in downtown Milford A new brewery has opened in the watershed. River’s Edge in Milford will bring brews to the river front. Stop by and welcome our new neighbor, either in car or kayak! Residents can now report flooding, drainage problems to county using online form Washtenaw County residents can now submit reports of flooding and drainage issues online. Photos can be uploaded too, to help identify the problem. This is a new feature. Residents can still report issues on email or by phone. Emergency issues should still be reported using 911.